There has been an avalanche of coverage on Greece’s economic situation in the past few months. Most of the coverage rightly attempts to diagnose the underlying problems of Greece’s government deficit and national debt, and how they might affect the value of the euro and the integrity of the eurozone. But, as anyone who has followed this story knows, Greece is not alone in this precarious situation. It is lumped into a group of EU countries that have been labeled the “PIIGS”-Portugal, Ireland, Italy, Greece, and Spain. Additionally, it is known that some of the other countries in this group have worse problems and are larger than Greece, which could have an even greater negative impact on the EU and the value of the euro. So, why the focus on Greece? The Greek situation is both complicated and simple. Greece has long had a bloated public sector that has employed disproportionate numbers of the population. This system has not operated on market or even traditional public sector principles, but rather on rousféti, or patronage. This means that there have typically been more civil servants employed than necessary, with shorter working hours and more lax conditions of service. All of these things have become targets for neoliberal reform around the world, as we are seeing harsh, IMF-style austerity measures once again being pushed as conditions on countries that find themselves in a bind. Next, the Greek state has long been known as a bastion of corruption. In the financial press, Greece is often described as a leader in black-market economic activity. In 2006, under the conservative New Democracy (ND) government (recently voted out of office), Finance Minister Giorgos Alogoskoufis “redefined” the always-problematic measure of social and economic well-being, Gross Domestic Product (GDP), by essentially adding an estimate of Greece’s well-known “black market” activities. In doing so, the government proudly announced that Greece and Greeks were 25% wealthier overnight! More importantly, the Greek government got on board with the global neoliberal program, catering to both domestic and foreign capital, and Washington. Beyond this, Greece is at the top of the list in military spending as a percentage of GDP in the EU. At the same time, Greek teachers are next to last in salaries in the EU. In the past few years, riot police have beaten and tear-gassed teachers and students more frequently than any other groups. Both the ND and their competitors in Greece’s two-party stranglehold, the Pan-Hellenic Socialist Movement (PASOK), have consistently been more in line with the neoliberal economic agenda and tougher in the social arena than their reputation in the West as the “black sheep” of Europe would suggest. In December 2008, a police officer shot and killed 15-year-old Alexis Grigoropoulos in Athens. Since the shooting occurred in the Exarchia neighborhood of the capital, many identified the incident with the anarchists, for whom Exarchia is a traditional center of activity. The police’s claims that the youth had attacked them, however, did not jibe with eyewitness accounts of the event. Greek society was outraged by the incident, and protests ensued across the country, lasting for weeks. The murder of Alexi was the spark that triggered the demonstrations and riots, but the causes were many and had been simmering under the surface of Greek daily life for a long time. Among those were the neoliberal policies of the ND government, such as the privatization of public services and cuts in social spending, in addition to police brutality, overt corruption and scandals, and poor job prospects and working conditions for youth, to name just a few. While youth and students from universities down through the elementary schools took the lead in organizing and conducting the demonstrations-many of which caused significant property damage, leading to a backlash against the protesters in some circles-a broad spectrum of Athenian society, including left political parties, unions, parents, and immigrant groups also joined in. It was this broad-based anti-government and anti-brutality outpouring that acted as a check against abuse and misrepresentation of events by the mainstream media in Greece. When the media portrayals of events didn’t correlate with what the people in the streets and their families directly experienced, the media’s credibility suffered. Mainstream news organizations were forced to modify or retract earlier reports of events. The legitimacy of both the media and the government suffered as parents listened to their kids, and as people from all walks of life and classes condemned the killing of Alexi, the government crackdown on dissent, and the sensationalized and inaccurate media depictions of the protests. police masquerading as anarchists were committing acts of wanton violence to inflame tensions and provide a pretext for a brutal crackdown on legitimate demonstrators protesting against police brutality and the mishandling of the economic crisis. These are the kinds of tactics that lie at the heart of many counterinsurgency strategies, and can be expected as government responses to anti-authoritarian dissent, especially during a period of economic crisis. Recently, José Trabanco, an independent writer based in Mexico, reported in an article on the website of the Centre for Research on Globalization on official concerns about potential civil unrest in the United States, as elites begin to grasp the magnitude of the economic crisis. This may not square with recent positive economic news, but we should be just as wary of numbers and projections from the White House as we are from credit-rating agencies. And this is the crux of why Greece is in the spotlight now. Greeks, like other Europeans, have a history of bold protest, direct action, and civil disobedience. They have shown willingness to fight for their own class interests, time and again. And this current crisis is no different. It is fine that Greek Prime Minister George Papandreou, German Chancellor Angela Merkel, and even President Barack Obama pay lip service to cracking down on financial speculators and the big banks. But none of them has moved seriously to regulate, restrict, or punish them. In the United States, we bailed the banks out with taxpayer money. In Greece, the government is introducing punitive austerity measures on the working and middle classes to pay for the “accounting magic” that Wall Street consultants, like Goldman Sachs and JP Morgan, provided to the previous government. Americans should arguably be more angry about the bailout of Wall Street than they already are. U.S. taxpayers are funding not only TARP and other corporate bailouts, but even the largesse of the Greek business and political elite. How? It was Goldman Sachs and J.P. Morgan that were hired to hide the magnitude of the Greek debt. Meanwhile, the executives on Wall Street continue to get paid spectacularly generous bonuses and serious financial regulatory reform is not currently on the radar in Washington. So it should also be clear is that these global bankers’ actions have global consequences. Why shouldn’t we Americans feel slighted? Barack Obama won the presidency on the slogans of “Hope” and “Change,” but the system continues to work for elites at the expense of ordinary people, here and abroad. On recent TV panel discussions in Greece, the mainstream political parties present the austerity measures as “necessary” and “responsible” solutions to a national problem. The government has even characterized the austerity drive as a “war effort,” arguing that Greeks should rally together to help pay for the crisis and return to traditional, hard-working Greek ways. Some are even resorting to invoking Barack Obama’s slogan of “Hope”! Yet the government is trying to impose the costs of the crisis squarely on the worse-off. The Bank of Greece recently admitted that the lion’s share of public revenues is collected from working- and middle-class households, while the rich and super-rich evade taxes. Meanwhile, it is precisely the working and middle classes that are targeted by the austerity measures. Besides that, austerity measures are arguably the opposite of what is needed during recessions and looming depressions. The real issue, then, is resistance. 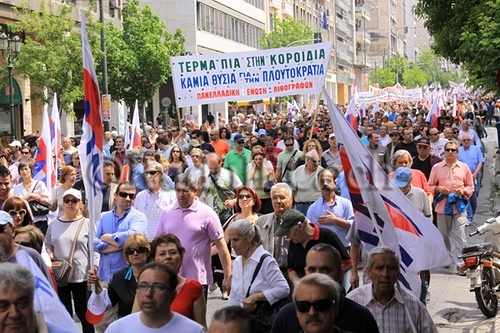 The Greek unions and public have been striking and demonstrating against the austerity measures by stating in clear class terms that, “We are not sacrificing to pay interest to the leaders!” The mainstream and business media analyses of the crisis in Greece and the PIIGS have focused on the potential impact on the euro. Given the choice, however, between the currency (and the perpetrators that created the crisis) bearing the adjustment costs and pain, or the Greek people paying for those costs in prolonged unemployment and poverty, who can reasonably argue for the latter? There are indications that mainstream union leadership will compromise with the government on austerity measures that cut wages and benefits. The question is whether the traditionally protest-oriented and militant Greek people will meekly accept what they see as an unjust solution to this difficult problem. Mainstream apologists argue that “there is no alternative” but for the working and middle classes to pay for the damage the banks and politicians have left. Greeks, however, are giving a class-conscious response. It’s not that they don’t want to deal with the crisis, but that many insist on taking it out of the hides of the perpetrators. So why has the focus been on Greece? To see if public-relations media blitzes, calls to national unity and patriotism, along with fear and repression, can squelch a traditionally militant and class-conscious working class. The Greek workers have historically been willing to take to the streets to defend their own material interests-their pay, their education, their healthcare, and their pensions. They know that saying “Hope!” is not enough, especially when the perpetrators of the current global economic catastrophe continue to operate unencumbered and unscathed. If the Greeks do not quietly accept the austerity measures, as the American public seems to be doing once again, there may have to be a more forceful demonstration effect in the form of violent confrontation between the people and the state. Whose state is it after all? And whose “mess” is this? The working people of Greece-or anywhere in the world, for that matter-should not have to pay and/or suffer for the crimes and risks of global financial speculators. Big business does not desire and will not stand for insubordination at this juncture. The non-productive paper economy that has taken control of the global economy is not sustainable for people or governments. There is frustration across the ideological spectrum around the world. The selfish interests that global financial capital is pursuing are naked. We must demand that these people be reined in. It is time for the “black sheep” to bite back. But then there are the PIIGS of Europe and us, here, in the United States. Let us recall the late Howard Zinn and ask: Which is worse at this moment in history-civil disobedience or civil obedience?